An anthology that delivers on its promise and its premise - and breaks a whole bunch of stuff along the way. The deluge of shared-world anthologies (one in which each writer's story takes place under a certain set of circumstances, and the events of one story are related to those of the rest) has seen a bit of a comeback in late years, although it hasn't yet reached the levels of the glory years of the eighties. 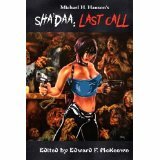 The premise behind Last Call is that the Sha'Daa is at hand - a cataclysmic event in which the walls between dimensions weakens, allowing demons to rampage on the earth once every ten thousand years, unless selected humans can use their courage and resourcefulness to thwart them. The stories themselves tell the individual tales of the people doing the fighting, everyone from trained sailors to an old man on the verge of suicide to a blind, deaf girl who is far from helpless must go above and beyond what they would normally give, in order to save humanity. Tying it together is the mysterious Johnny, the Salesman, who will intervene and assist - at a price. Now, if you're imagining a group of action oriented stories in which the struggle between good and evil takes place both on the physical and mental plane... Well, you'd be right. But that simple description doesn't quite do justice to the stories here. These tales are fun, and they keep you reading. And if you take a quick peek at the name of the authors, I think you'll understand why, too. A very, very good list of writers who know their way around an action story. As always, there are some stories I liked better than others. My favorite was probably "A Question of Faith" by Arthur S?nchez, in which the church itself struggles with its own secret knowledge - and the different interpretations that individuals might have of it. Not to mention a rather large demon. Another good one was Bruce Durham's "Deathstalk", which is probably the polar opposite: a straight action story where the race is against bad guys and time, and the atmosphere is about as chilling as they come. Noteworthy as well was James I. Wasserman's story "The Four Horsemen". A strong closing tale, and one with more than it's share of twists and turns, following the format of a serial killer story in which the cop herself isn't quite working for the forces of good. I could go on. The stories were all even and well-written, and unusually, there were none that I could point out as weaker than the rest. Artwork was also a high point, at least for me. They included dread monsters and beautiful women - although I'll admit that some might find them a bit over the top. People who are offended by certain portrayals of feminine beauty (always clothed, though) would do well to avoid this one. I'd say that the cover would be a good guide to the artwork within. Finally, I'd also have to point out that those readers who don't particularly like action-adventure stories will not enjoy this book. This one worries more about how to deal with evil than on the great philosophical questions. It does so very well, but I know that might not be to everyone's taste. In conclusion, this is one for when you are in the mood to be entertained by a group of excellent storytellers stretching their imagination to the depths to give us horrendous monsters - and great deeds of courage.